filed: June 20, 2012 • Spain, U.S.
With turbines threatening some bird and bat populations, researchers are seeking ways to keep the skies safe for wildlife. Marc Bechard turned a worried eye skywards as he walked among the limestone hills at the southern tip of Spain. It was October 2008, and thousands of griffon vultures – along with other vulnerable raptors – were winging towards the Strait of Gibraltar and beyond to Africa. But first they had to navigate some treacherous airspace. The landscape on either side of the strait bristles with wind turbines up to 170 metres high, armed with blades that slice the air at 270 kilometres per hour. 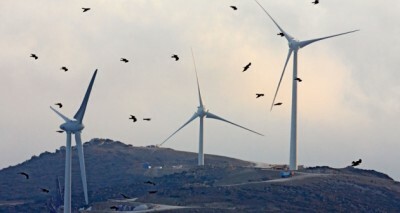 Bechard, a biologist at Boise State University in Idaho, and colleagues from the Doñana Biological Station in Seville, Spain, had been hired to help the birds make it safely past 13 wind farms in Cádiz province. Each time the researchers spotted a raptor heading towards a turbine, they called the wind farm’s control tower. Within minutes the blades slowed to a stop, and one more migrating bird soared past unharmed. Then the turbine swung back into action. The deaths caused by turbines have the potential to harm not only wildlife, but also the wind-energy industry, which is the fastest-growing source of power worldwide, according to the World Bank. With critics vilifying wind turbines as ‘bird blenders’, wind companies, governments and researchers are teaming up to mitigate the problem before it reaches a crisis point. Cádiz province, for example, requires all wind-energy projects to consider environmental issues, and helps to fund research on reducing any damage. The early signs are that with targeted efforts, wind power and wildlife can cautiously coexist. Bechard and his colleagues, for example, lowered mortality at the Cádiz wind farms by 50%, with only a 0.07% loss in energy production1. Others are finding that minor changes in the design or operation of wind farms can bring major reductions in animal deaths. Wind power is poised to take off as the world seeks new sources of renewable energy. The industry is growing most quickly in China, which plans a 60% increase in wind power in the next three years. The US Department of Energy is aiming for a sixfold jump by 2030, and the European Union is working towards supplying 20% of its energy demand using renewable sources by 2020, much of that from wind. But the rapid expansion of wind power can harm wildlife in multiple ways. Beyond direct collisions with turbines, wind farms threaten species by displacing habitat. And bats can develop fatal internal haemorrhaging as a result of air-pressure changes when they fly through the wake of a spinning blade. The industry maintains that the effects on wildlife are minor. Although there are only a few, limited estimates of bird fatalities at a national level, the available data for the United States suggest that wind farms account for a tiny fraction of avian deaths (see ‘Bird killers’). But the concern is that turbines threaten species that are already struggling, such as bats, which in North America have been hit hard by white-nose fungus. Another vulnerable group is raptors, which are slow to reproduce and favour the wind corridors that energy companies covet. “There are species of birds that are getting killed by wind turbines that do not get killed by autos, windows or buildings,” says Shawn Smallwood, an ecologist who has worked extensively in Altamont Pass, California, notorious for its expansive wind farms and raptor deaths. Smallwood has found that Altamont blades slay an average of 65 golden eagles a year2. “We could lose eagles in this country if we keep on doing this,” he says. In Cádiz, temporarily shutting down turbines has worked because the biggest threat is to migratory birds, which pass through only occasionally. Similar methods could reduce mortalities along the migratory bottlenecks in Central America, Europe and Asia, says Miguel Ferrer, a conservation biologist at Doñana and a co-author of the Cádiz study. But that tactic will not work in Altamont Pass, which has both migratory and permanent avian populations. Instead, companies there are making headway by replacing small, ageing turbines with fewer large ones. Choosing sites carefully can help, too. “Raptors do not use the landscape randomly,” explains Doug Bell, wildlife programme manager with the East Bay Regional Park District, which manages parklands and monitors wind farms around Altamont. When the Buena Vista Wind Energy Project at Altamont replaced 179 turbines with 38 taller ones in 2006, Smallwood advised the company to avoid ridge saddles between hills and other hotspots for raptor traffic. Since then, golden eagle fatalities at Buena Vista have dropped by 50% and other raptor deaths by 75%, says Smallwood. In the eastern United States, Todd Katzner, a biologist at West Virginia University in Morgantown, finds troublesome locations using a tracker designed to fit on golden eagles. “We can identify places where there are wins for both sides,” he says. Moving a turbine site by a few hundred metres can substantially reduce the risk of collisions, says Katzner. Companies say that they have learned from past mistakes. “That there hasn’t been another [location like] Altamont Pass for years should be an assurance that the wind industry has gotten better at siting,” says Stu Webster, director of permitting and environmental affairs at Iberdrola Renewables, a renewable-energy firm in Portland, Oregon. Sometimes a slight change in procedures can make a big difference. For example, most turbines are set to turn on when wind speeds reach 4.0 metres per second. But when the Iberdrola Renewables Casselman Wind Project in Pennsylvania increased the threshold to 5.5 metres per second, it slashed deaths of bats – which don’t fly as much in high winds – by 93% while shaving just 1% off of power production, says Ed Arnett, who conducted a study there3 while working at Bat Conservation International in Austin, Texas. Some wind farms are betting on technology to make a difference. The MERLIN radar system, made by DeTect in Panama City, Florida, scans the skies for up to 6.5 kilometres around and uses algorithms to detect incoming flocks and even individual birds and bats, says Gary Andrews, chief executive of DeTect. Iberdrola Renewables and Pattern Energy, a wind-power company based in San Francisco, California, are using the system at wind farms, as is Torsa Renewables, based in Malaga, Spain. Some researchers question the effectiveness of the radar. In 2010, a US Fish and Wildlife Service biologist saw a blade hit an American white pelican (Pelecanus erythrorhynchos) at Iberdrola’s Peñascal wind farm in Texas, which was using MERLIN. But Iberdrola says that the system there is set up to prevent mass mortalities, not to detect individual birds. According to Iberdrola, birds are most at risk in fog or other periods of low visibility, so Peñascal sometimes shuts down turbines during bad spells, unless the radar reveals that there are no birds around. Generally, however, the radar indicates that birds avoid the turbines by themselves. “We have terabytes’ worth of data that are showing us how birds actually react to wind farms,” says Webster. Companies worry that any monitoring data that they release could be used against them in lawsuits by environmental organizations or in political attacks from groups that support the fossil-fuel industries and want to scuttle wind power. The American Wind Wildlife Institute, a coalition of industry and conservation organizations based in Washington DC, is attempting to remedy the situation by creating a limited-access data repository that protects company privacy. The institute expects to complete the pilot phase of the project by mid-summer. Even as they start to open up, some sectors of the wind industry acknowledge that they should do more to head off problems. “We as an industry need to do a better job of incorporating mitigation strategies into our economics,” says John Calaway, director of wind development at Pattern Energy. The strategies seem to be working in Cádiz, but Bechard still frets when he sees vultures on the horizon. “It’s always nerve-wracking” wondering whether the turbines will stop in time, he says. When the birds pass safely, he breathes a sigh of relief. But with wind farms popping up around the globe, Bechard worries about what the vultures will encounter as they disappear into the distance. de Lucas, M., Ferrer, M., Bechard, M. J. & Muñoz, A. R. Biol. Conserv. 147, 184–189 (2012). Smallwood, K. S. & Karas, B. J. Wildlife Manage. 73, 1062–1071 (2009). Arnett, E. B., Huso, M. M. P. Shirmacher, M. R. & Hayes, S. P. Front. Ecol. Environ. 9, 209–214 (2011).